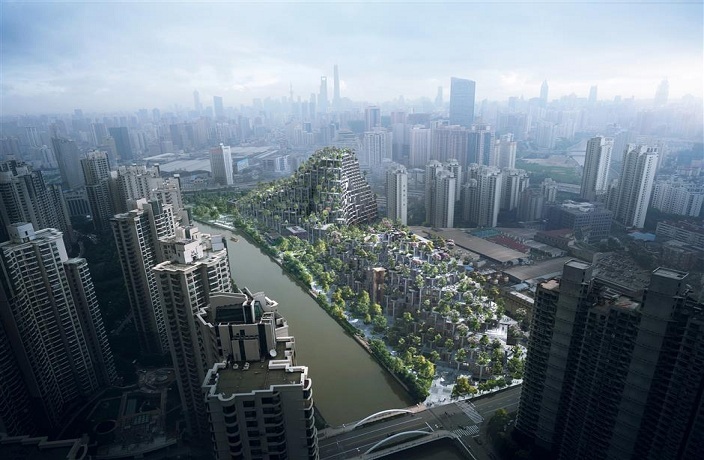 Shanghai will soon have its own ‘Hanging Gardens of Babylon,’ right along the Suzhou Creek. According to Shine, the main construction of the design called ‘Tian An Sunshine Peninsula’ has recently been completed, with the remaining development on target for a late 2019 debut. The complex stands out among the Suzhou Creek residential location, with its terraced landscape covered with numerous plants. 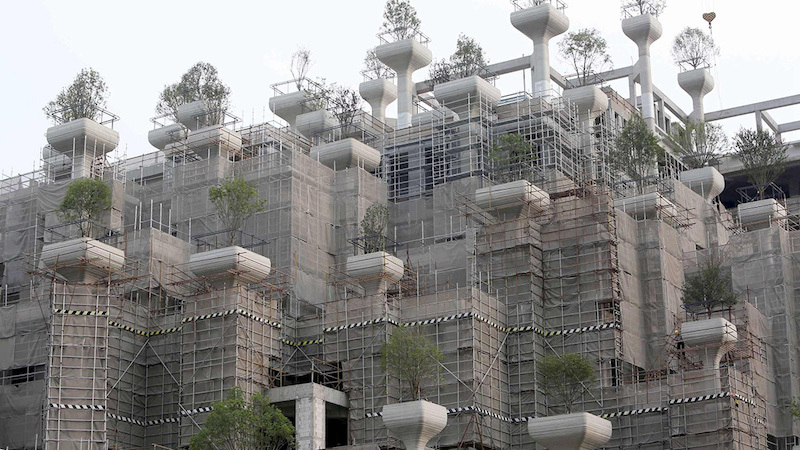 Occupying an area of 300,000 square meters, the building is said to consist of more than 400 balconies and approximately 1,000 newly-planted trees. “In my initial concept, the structure would be developed as part of nature rather than architecture,” Thomas Heatherwick, the designer of the complex, told Netease. “To develop the nature element, we decided to incorporate a large number of trees.” This may explain why the project is dubbed “1,000 Trees” by Heatherwick Studio. Once the complex opens to the public, it will become a comprehensive center combining residences, a school, offices and a boutique hotel. Heatherwick, who is renowned for his previous works that include the UK Pavilion at the 2010 Shanghai Expo and the 2012 Olympic cauldron, further explains how the architecture under construction is the first, of two phases. A similar but larger hanging garden will spring up to the east of the current one, in the years to come. The building’s appearance already went viral last year with many netizens impressed by the recreation of the wonder of the ancient world. Some, however, we not so overawed, instead complaining about the abnormal appearance, pointing out on Weibo that the structure looks like a three-dimensional graveyard. Given that construction is still in its early days, let’s hold our judgment until there’s more to see. Regardless of the outcome, it’s safe to say that this new architectural design will definitely add a unique and unconventional touch to the Shanghai skyline.